Is there such a thing as low carb pasta? Not that I know of but pasta will not raise your blood sugar in small amounts. 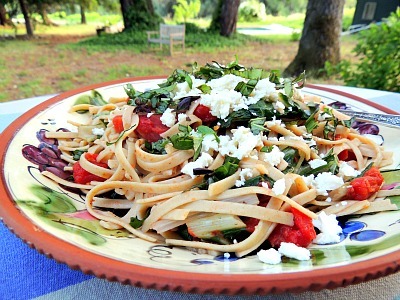 The good news for pasta lovers who want to lose weight or just maintain their fat loss is that pasta is low glycemic. However, it is carbohydrate dense so you need to limit your serving size. When it comes to pasta it is best to eat high protein pastas like Barilla Plus and pasta made from quinoa or other whole grain pastas and eat small amounts. These pastas are slower to digest and metabolize to glucose. Complex carbohydrate foods are essential for you especially when you have fat to lose - it's the blood sugar spikes that come with high glycemic carbs you don't want. A small serving of pasta will not cause a blood sugar spike but if you load up on it, it could. A serving size is 1/2 cup cooked pasta and it has about 18 grams of carbs in it. This means you need to eat it very sparingly. Pasta is filling so it's not hard to eat only a serving size at any one meal. A serving size of pasta will not raise your blood sugar and stimulate fat storage, however, the healthiest and smartest pastas to eat for good weight management are made from whole grains and are high protein. The higher in protein it is, the lower the glycemic index. The whole grain pastas have more nutrients and usually have more protein. You have to think in terms of foods that are nutrient dense not just whether a food is low glycemic. Quinoa pasta and Barilla Plus (yellow box) are not low carb pastas but they are low glycemic, high protein, nuritious pastas and they are readily available. Barilla Plus is in most grocery stores and Ancient Quinoa Harvest is in natural food stores like Trader Joe's. Ask your super market to carry it. The Ancient Quinoa Harvest brand of quinoa pasta is less expensive than other whole grain pastas. It's also gluten free if you are sensitive to gluten and it has great flavor! Quinoa is a highly nutritious South American grain that contains the highest amount of protein of all the whole grains. This makes it an excellent choice for vegetarians, dieters, and children. Pastas are low glycemic if they are not overcooked. Be sure to cook them al dente which means just barely tender. The multigrain pastas on the market now are lighter than ever and very tasty. Be aware that all canned pastas are high glycemic. Cook the pasta according to the directions on the box. Just add a few of your favorite sautéed veggies, a teaspoon of olive oil and grate some fresh parmesan on top. This will be the hard cheese in the refrigeration department. Do not use the commercial parmesan that comes grated in a container. It has high glycemic additives. Very quick and easy meal when you add a simple salad. When it comes to carbohydrate foods and managing your weight and blood sugar, you need the right kind of carbs, the low glycemic kind. This means the high protein pasta, quinoa or Barilla Plus. The other excellent choice for pasta on your weight loss plan are any of the whole grain pastas. You can make your own low glycemic pasta sauce by sautéing some onion and minced garlic in a little olive oil and then adding some chopped, fresh tomatoes or canned, chopped tomatoes, salt, pepper and basil to taste. If you have hearty eaters, add ground beef and cook until done before you add the tomatoes. You won't need to eat a large amount because it's so filling. If you buy your pasta sauce be sure that it is made without corn syrup, sugar or other high glycemic additives. There are lots of good ones on the market now. Don't bother looking for low carb pasta because there is no such thing. All pastas are high density carbs. Look for the ones that are slow to digest and will keep your energy sustained for a few hours. It's not that some pasta has fewer carbs in it, it's all high in carbohydrates. It's that the high protein or whole grain pastas do not raise your blood sugar. At 18 grams of carbs per serving it has a moderate glycemic load so be aware. When it comes to pasta you need to be careful not to eat more than 1 serving (1/2 cup) at a meal. Not all carbohydrates are created equal when it comes to fat storage. You always want to seek out the low glycemic carbs and manage your portion control. Pasta is very filling so when you add some sauce and vegetables to a serving size (1/2 cup) it's enough to feel satisfied. Barilla Plus and Ancient Quinoa Harvest Pasta have the lowest glycemic index because of protein content but all pasta is low glycemic. Any quinoa pasta is a great choice and has great flavor. Some pastas have added flaxseeds which means they provide heart healthy omega 3 fatty acids. Low carb pasta they are not, but they are all low glycemic. For many more articles on eating the right carbs and other low glycemic foods for permanent fat loss, please scroll down. The glycemic index list of foods includes foods that lower blood sugar and help you to lose fat. Controlling food cravings means that you need to avoid the high glycemic foods on these lists. High glycemic sugars in foods stimulate the appetite and lead to food cravings. This list of raw foods contains fruits and vegetables that are a powerhouse of nutrients and they are low glycemic, meaning you can eat as much of them as you desire. Healthy salads, especially when you add Omega 3 sources or foods with resistant starch, are a great low glycemic meal. These are fat burning foods and have a low glycemic index. Eating lots of super healthy low glycemic foods means that you are once and for all replacing the fat storing high glycemic carbs in your diet with the low glycemic complex carbohydrates. High fiber foods, the whole grains and legumes or beans are essential for keeping your blood sugar low, your cholesterol and triglycerides low and for fat loss. You need to look to the good fats for a healthy diet and to lose body fat. Take a look at dairy products and just how these calcium rich foods affect the glycemic index. There is a low glycemic sweetener that is a great substitute for table sugar when baking. This low glycemic index chart shows the soups, the oriental cuisine and the protein foods that do not raise your blood sugar. This will give you a more precise understanding of how eating low glycemic foods will help you lose fat and keep it off. Any list of acidic foods will have sodas at the top of the list. These drinks are high glycemic and fat storing drinks. Here are more high glycemic foods that need to be avoided most of the time in order to maintain your fat loss. Find out where the fat traps are hidden. This is what leads to obesity and insulin resistance. Food lovers can celebrate good food and manage their weight at the same time! Return from Low Carb Pasta to Foods That Lower Blood Sugar. Return from Low Carb Pasta to Lifetime Fat Loss home page.